Bead embroidery is the process of stitching beads to fabric, leather or other foundation material to embellish the surface. Bead embroidery does not require many special tools or supplies beyond the basic bead weaving supplies. Unlike off-loom bead weaving stitches or loom beading where beads are stitched to each other, in bead embroidery, you stitch beads onto a fabric foundation. Since there are so many different types of beading foundation available, it is important to know which one will work best for your particular project. Some of the different bead embroidery foundations used include imitation leather or suede, fabric embroidery interfacing, or a special product designed just for bead embroidery called Lacy's Stiff Stuff. Bead embroidery foundations can be found in a wide variety of craft stores, fabric stores, beading supply companies, and online bead shops. As part of the bead embroidery "sandwich" that you create when making a piece of bead embroidered jewelry or art, you will most likely need some kind of lining to stiffen your beadwork. Using a lining will make your pieces more durable and will help prevent the beadwork from losing it's shaping over time. Bead embroidery linings can be something as simple as a piece of a plastic milk jug or as specialized as a brass embroidery blank from Designer's Findings. You should always try a variety of materials to find out which ones work best for your specific projects. The last layer in your bead embroidered "sandwich" is the backing. Backings don't just cover the bead embroidery stitches and hold the lining in place; they also protect the beadwork and make it comfortable to wear. The best choice for a bead embroidery backing is some kind of fabric. Ultrasuede and Sensuede are preferred by many professional bead artists, and even a thin piece of natural leather can be used. A good bead embroidery backing will make your piece look professional. Beading thread is what you will use to stitch your beads to the bead embroidery foundation. There are two basic types of beading thread that are widely used by leaders: nylon beading thread and gel-spun or fishing line-type thread. Some readers swear by nylon beading threads for their bead embroidery. They are soft, strong, and will not create large holes in the bead embroidery foundation. They also come in a wide variety of colors and thicknesses to accommodate many types of beads. Others prefer to use the gel-spun or fishing line-type threads. These are also strong and somewhat stiffer than the nylon threads, and they don't come in a wide range of colors like the nylon beading threads. Some of them can be dyed with permanent markers. Either type of beading thread will work well for bead embroidery, so it is a good idea to try both types and see which ones you feel most comfortable using. To do bead embroidery, you can and should use regular beading needles. Use an appropriately sized needle for the beads and thread that you are using, as you may need to make several threads pass through the beads to secure them and strengthen the embroidery. English beading needles or milliners needles are the most popular choice for bead embroidery. Their size and strength make them perfect for using with leather and Stiff Stuff. If you have trouble threading your beading needles, there are lots of tips and hints that you can try to make the process a little easier. The best part of bead embroidery is that anything goes when it comes to which beads you use. Seed beads, crystal beads, freshwater pearls, and shaped, pressed glass beads are some of the most popular choices. You can also use bugle beads and other shaped seed beads to create texture and lines in your work. It is also possible to incorporate other more unusual beads and components in your bead embroidery. Many leaders love to include gemstone, glass, ceramic cabochons, gemstone donuts, and all types of natural beads like coral and tiny seashells. Coral branches and sticks can be included, as well as lightweight metal beads. 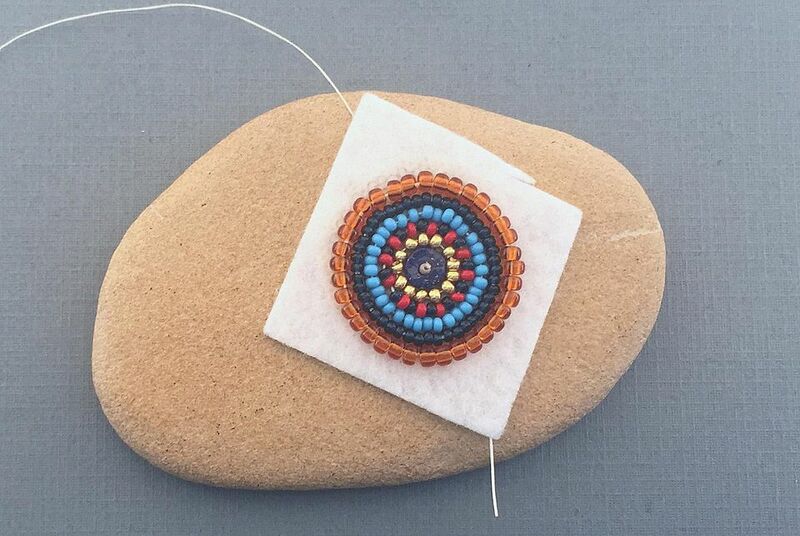 If there is a bead that you want to use in a bead embroidery project, with a little trial and error and a little patience, you can use just about any type of bead that you want to and create a beautiful, one-of-a-kind piece of beaded art.